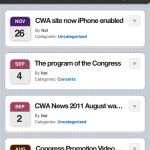 CWA site is now iPhone enabled. If you access the site with iPhone, you will see iPhone optimized screen. It also features tweet button as well.